We are pleased to announce a major breakthrough in the struggle of the mi ners of Kryvyi Rih which has been a beacon of hope in crisis ridden Ukraine. After being ignored for months the miners of the Ukrainian industrial metropolis of Kryvyi Rih have had a breakthrough in their dispute with the corporate giant EVRAZ, securing a nearly 20% increase in their wages. The miners employed by EVRAZ at Suha Balka mine submitted a claim for a 50% pay rise and improvements to their conditions. NGPU began organising strike action, which is a convoluted process due to Ukraine’s restrictive Labour Code. This activity was accompanied by a direct appeal for international solidarity, specifically calling “upon the workers of Britain for solidarity”. 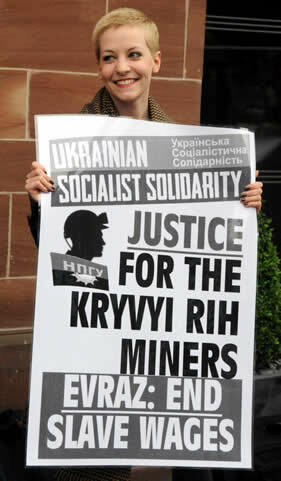 The Ukrainian Socialist Solidarity campaign played an important role in publicising widely the appeal of the Kryvyi Rih miners to the workers of Europe. On 23rd May the United Steelworkers Union in Canada picketed the EVRAZ plant in Regina in solidarity with the Ukrainian miners, prompting the Vice President of Human Capital to fly directly from the North American HQ in Chicago. This was joined by a protest at the EVRAZ London HQ by socialists and trade unionists of the Ukrainian Socialist Solidarity campaign on the same day. The demands for Justice for the Kryvyi Rih miners were also raised in the House of Commons in an Early Day Motion (137) by John McDonnell MP and in a the National Assembly of Wales tabled by Mick Antoniw. When an official notice of dispute was served bringing the miners’ strike action nearer, a picket headed by John McDonnell MP was held at the EVRAZ AGM on 12th June at Abramovich’s Chelsea FC. The top share-holder of EVRAZ is Roman Abramovich worth $14.2 billion, next in line Alexander Abramov is worth $7.5 billion. The average monthly salary at Evraz’s Sukha Balka mine is 5290 Hryvnia, a mere £262.85. This combination of international solidarity and the miner’s campaign brought the oligarchs to the negotiating table the very next day. The campaign forcing a concession from the EVRAZ Corporation providing for a salary increase for all workers of 15 – 20%. There is now ongoing negotiations between the NGPU and the EVRAZ management. The campaign is not over and these are gain to build on. It is important however to note that the success of the Kryvyi Rih miners.